Suffolk County Crime Stoppers and Riverhead Town Police officers are seeking the public’s help to identify and locate the woman who stole merchandise from a Riverhead store in December. 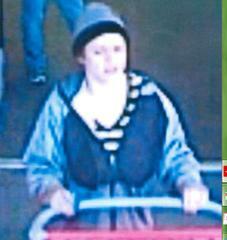 The woman stole assorted merchandise from Target, located at 1150 Old Country Road, at 12:53 p.m. on December 18. The merchandise totaled $195.84. The woman was described as white and wearing a gray hat, blue and gray sweatshirt with gray pants.